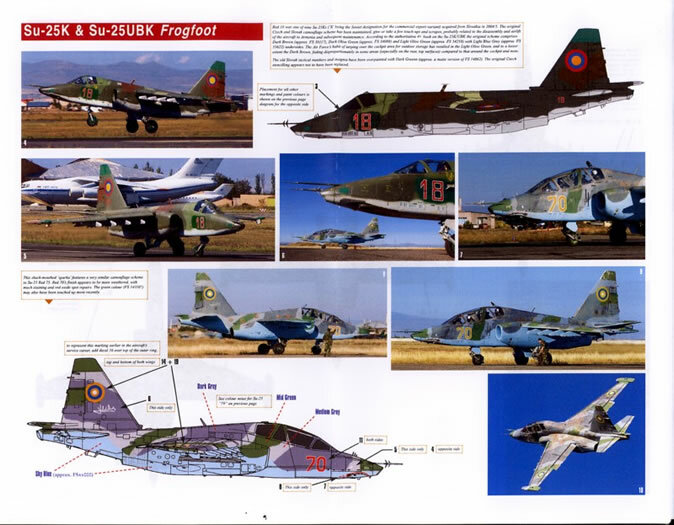 Comprehensive sheet providing complete coverage of multiple aircraft types from three different Post Soviet Air Forces. Perfect register and minimal carrier film. 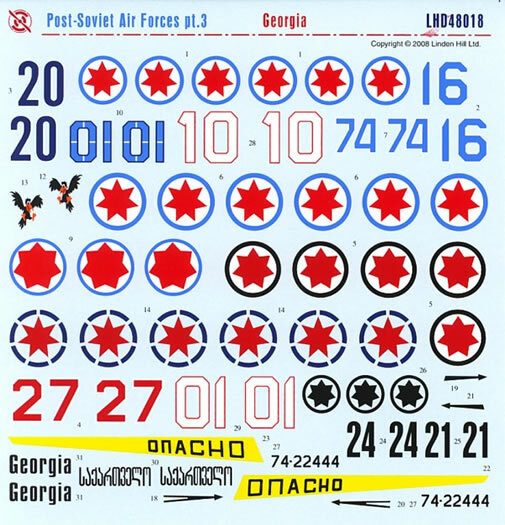 Georgian sheets include two decal options for Georgian UH-1Hs. 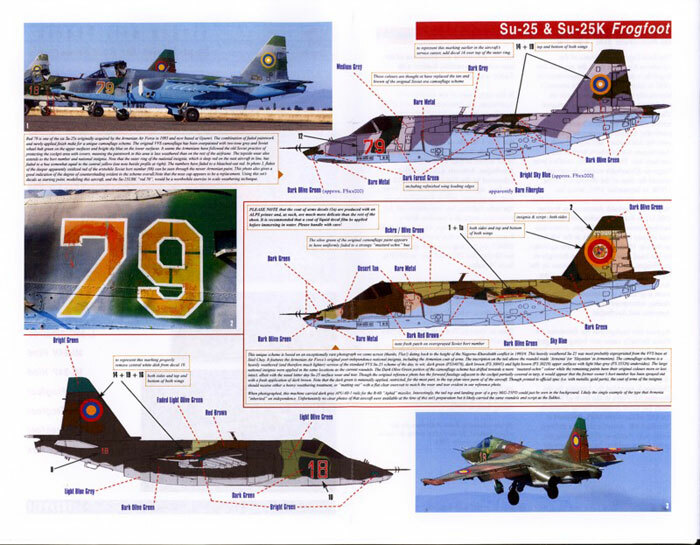 Detailed instructions and decal sheet map included. Some kits and conversions may be hard to source. A set of interesting and unusual subjects, will stand out in a model collection. 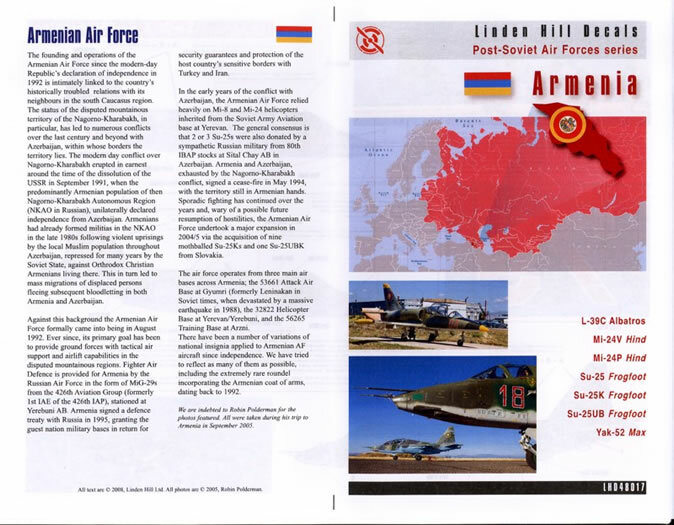 A must for modelers of Soviet and FSU Air Forces. 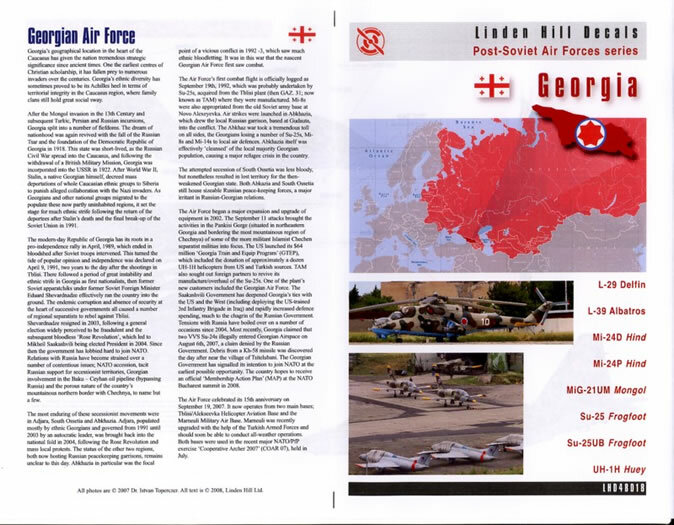 This new series from Linden Hill again breaks new ground for the unusual and gives the modeler yet another set of unusual and interesting subjects, this time inspired by the Air Forces of some of the former Republics and territories of the Soviet Union. 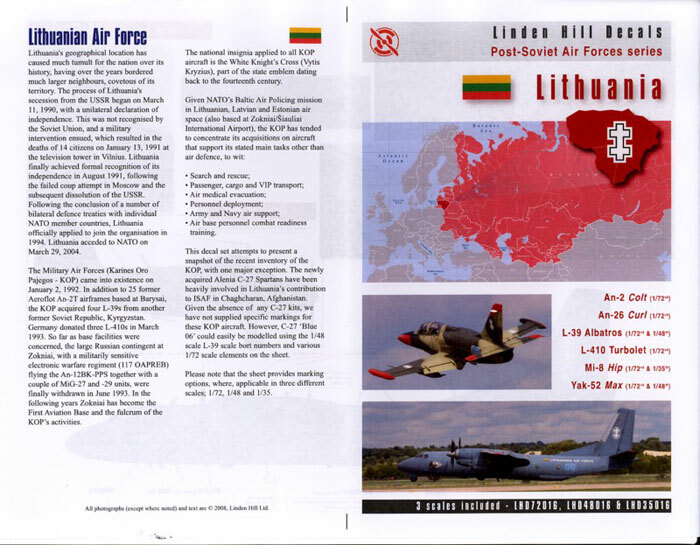 Naturally many of these countries inherited equipment from the Soviet Union, ranging from training aircraft to attack helicopters. 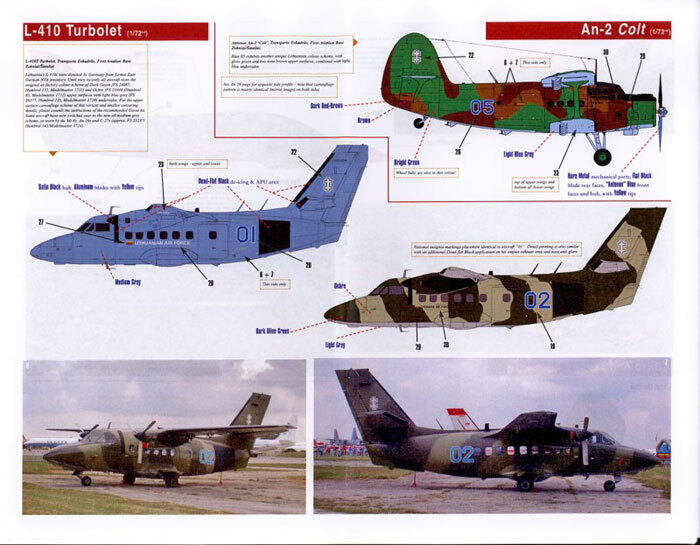 Given the economic and political conditions at the time of the collapse of the Soviet Union, these Air Forces largely adopted the cheaper and simpler equipment to operate, largely in a potential counter-insurgency role. 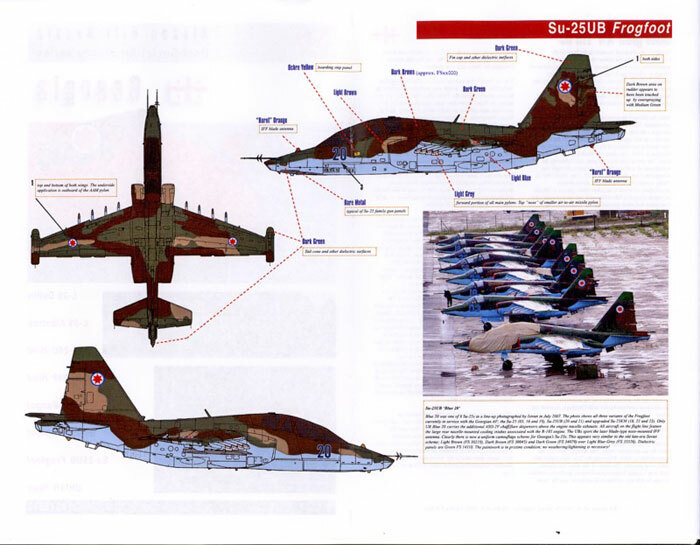 These cheap, reliable and easy to maintain combat capable aircraft present colourful modeling options. With a well deserved reputation for their research and access to information that others often only guess at, it is no surprise that this selection will probably have something to wet the appetite of any fan of the unusual. 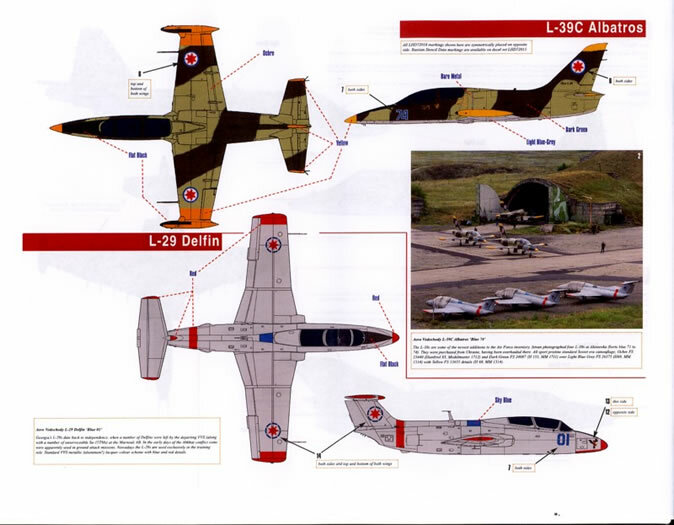 The neat ziplock bags contain a comprehensive instruction booklet, with plenty of colour profiles of the subjects, modeling notes, reference photos and supporting text including a history of the respective Air Force. 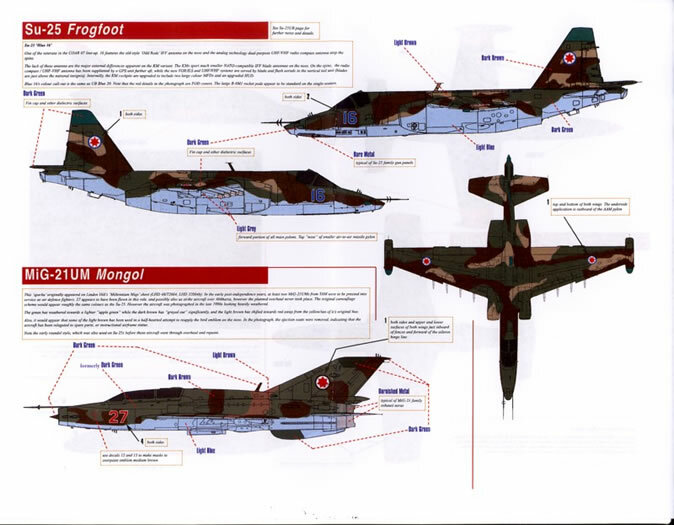 The instruction books covers no less than six A4 pages as well as a neat inclusion of a page for the modelers own project notes. Given the complexity of the subjects this will be quite useful. The decals themselves are spread over slighty smaller than one A5 sheet per set. 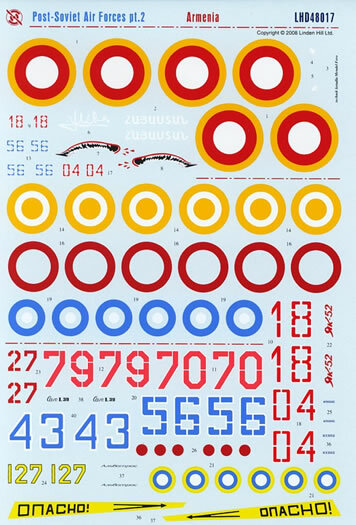 The first set 48016 is actually a combined set with subjects based on 1/72, 1/48 and 1/35 whilst the other sets are 1/48 with separate sheets for the other scales available from Linden Hill. 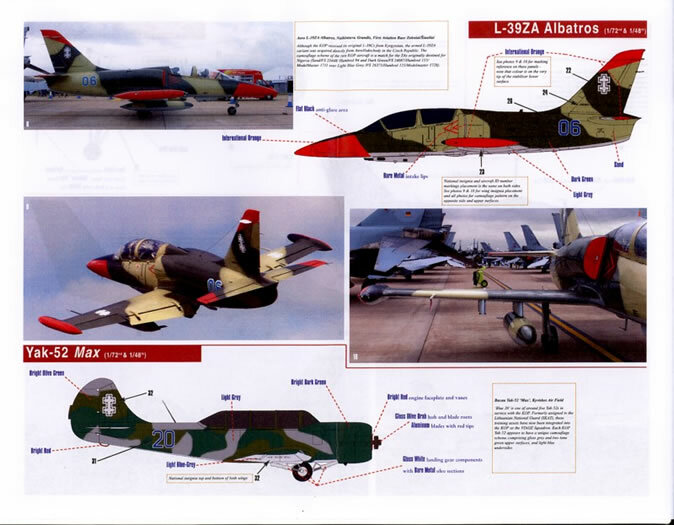 Given the unusual types it is surprising to find a kit indentified for every option thanks to the likes of Eduard, MPM, Gavia, AModel and NeOmega. Again there are kits or conversions for all options, although the limited run nature of some might make them hard to find. For instance I have not seen an OEZ Frogfoot kit in Australia for several years despite combing hobby shops and swap meets in five cities. 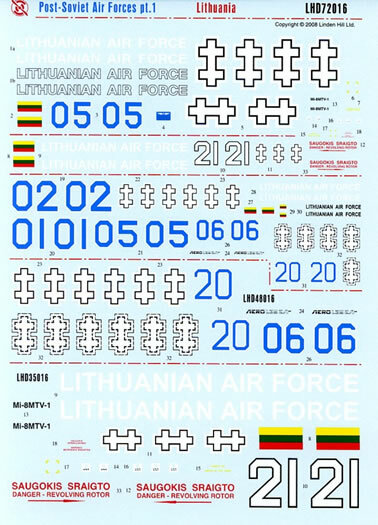 All three scales also include two decal options for Georgian UH-1Hs. Again kits for some of these subjects are available but possibly hard to find. As one can imagine, with three post Soviet operators there are numerous variations on colours applied. Linden Hill have helpfully provided some FS approximations for all schemes, along with some recommendations from major paint manufacturers for some of the more unusual colours. 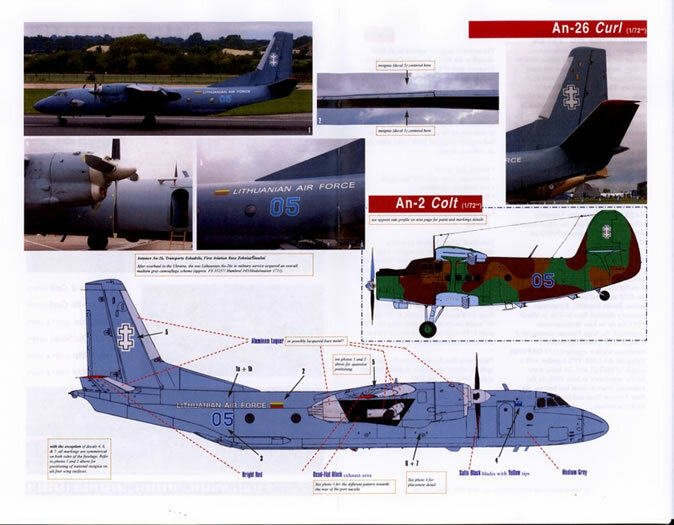 Colour photographs of some subjects are also included to help the modeler. Linden Hill’s sheets are very well printed, being very thin and with minimal carrier film. The complex designs themselves are in perfect register. The decals are easy to use and respond well to the usual solutions without damage. Being thin they conform well to details over which they are laid. Yet again Linden Hill has come up with an excellent product and they should be congratulated for bringing these unusual subjects to the market.